The Delta Queen and a Russian riverboat symbolically joined in peace. In 1986, two boats - one in the US and one in Russia - took a stand for world peace. This image is on display in the Russian Museum for politcal History, which is housed in the historic building where Lenin mustered the Bolsheviks to storm the Palace. "Apparently back in 1986 there was a rus/us peace movement happening (remember this is in the days of Brezhnev) where people marched in both the US an Russia to promote peace. 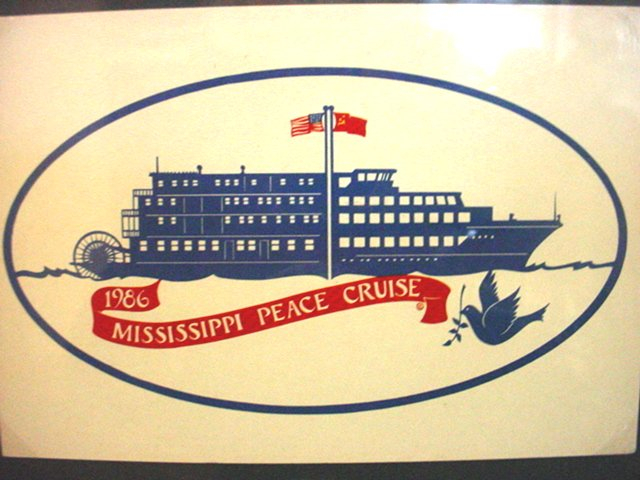 I believe there were 2 peace cruises, one on the DQ and the other on a Russian river boat on the Volga." Click here for photos of Russian paddlewheel steamboats.